Beth first stepped into a yoga class at Indiana University. Initially looking for a complement to marathon running, her yoga practice provided more than a good stretch. Yoga provided gifts of balance, peace and awareness to handle life’s challenges. 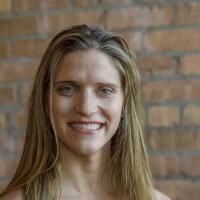 Beth has been a student of yoga since 2003 and completed the Bloom Yoga Studio 200-hour teacher training program in 2015. Beth wants her students to have a challenging yet safe physical practice and experience the quietness of the mind that drew her to the yoga mat. Sunday morning yoga with Beth stretches your limbs, your mind, as well as your weekend. There is a special peace and calmness that comes with practicing yoga at this time. Beth is a wonderful yoga instructor caring for all her students. She uses several modalities to accommodate her students to their individual abilities. She reminds you relax with her soft-spoken voice showing you how to do varieties of poses in a very clear instruction. She is simply an excellent instructor. Phoenix Yoga Project is a non-profit 501(c)(3) organization.